Three dentists and two hygienists from Aspen Dental offices volunteered their time and talents in Haiti earlier this month (Nov. 4-9), providing free dental care in a country where there is just a single dentist for every 100,000 people. The team – – based in the town of Jacmel, three hours from Haiti’s capital of Port au Prince – – provided vital oral care in a neighborhood clinic in conjunction with Restore Haiti. Operating daily in a cinder block structure amidst a shortage of water and unstable power supply, the volunteers provided nearly 500 Haitians with free care and oral care education. Leading the team of clinicians was Dr. Chedly Schatzie Vincent, owner of the Aspen Dental practices in Fairfield and Norwalk, CT.
Dr. Vincent traveled with four colleagues from several Aspen Dental practices: Dr. Jennifer Check of Monroeville, PA; Dr. Ekta Sagar of Hanover, PA; and hygienists Marissa Leach, RDH of Manchester, NH and Marilyn Bartley, RDH, of Norwalk, CT.
With more than a dozen boxes of supplies, the team had everything it needed for general hygiene care and preventative dentistry, including kits for tooth extractions and fillings, portable X-Ray machines, gauze, needles, sutures, and antibiotics. But working conditions made practicing dentistry a challenge. The team received support from Henry Schein, the world’s largest provider of health care products and services to office-based dental, medical and animal health practitioners. Among the select few physicians honored with the prestigious Patients’ Choice Award this year is Dr. Alexander Pazoki. In fact, of the nation’s 870,000 active physicians and dentists, just five percent consistently received top scores from their patients on sites like Vitals (http://www.vitals.com), qualifying them for this honor in 2012. Millions of patients go online each year to rate their doctors on various components of care, including accuracy of their diagnosis, the amount of time they spent with the doctor, and the doctor’s bedside manner and follow-up care. Patients’ Choice reviews these rankings and other quality measures to compile its yearly list of award winners. Dr. Pazoki is affiliated and works at Johns Hopkins Hospital, department of Otolaryngology Head and Neck Surgery. He also has been part of University of Maryland Medical System Shock Trauma team providing complex reconstructive procedures. His area of expertise include: facial reconstructive and cosmetic surgery, oral and maxillofacial oncology and cancer reconstructive surgery, implant and reconstructive jaw surgery. He is both a physician and a dentist with additional training in cosmetic, cancer and reconstructive procedure. He is a member of American head and neck society as well as European facial plastic surgeon and board certified in Oral and Maxillo-Facial Surgery. 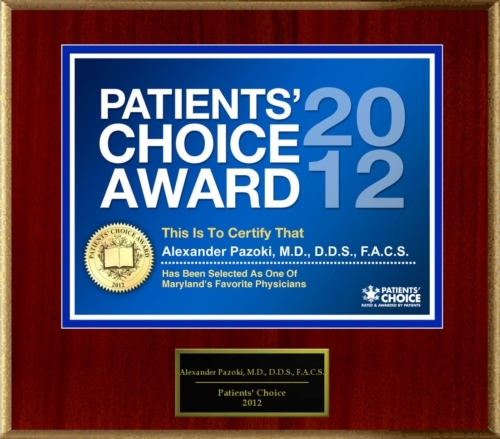 For more information on this Patients’ Choice Award winner, please visit Dr. Alexander Pazoki’s profile on PatientsChoice.org. Following the publication of Alexander Pazoki’s selection for the Patient’s Choice Award, American Registry seconded the honor and added Dr. Pazoki to The Registry™ of Business Excellence. An exclusive recognition plaque has been designed to commemorate the honor. The doctor’s custom wall plaque is shown here. For more information on Dr. Alexander Pazoki, located in Bel Air, MD, please call 410-908-2809. This press release was written by American Registry, LLC with approval by and/or contributions from Dr. Pazoki and was distributed by PR Newswire, a subsidiary of UBM plc. Patients’ Choice provides in-depth information on doctors in your area who have been recognized and awarded for outstanding patient care and expertise. The Patients’ Choice Award is the honor roll of physicians who have received the highest ratings by their patients. ZocDoc arrives in the Las Vegas area today, helping residents and visitors alike effortlessly secure faster access to local medical care. ZocDoc is a free service that allows patients to find a doctor nearby who accepts their insurance, view the doctor’s real-time availability, and instantly book an appointment online. The typical ZocDoc patient sees a doctor in 24 to 72 hours – a vast improvement from the weeks-long wait time average that Las Vegas patients currently experience. At present, patients can use ZocDoc to book appointments with participating Las Vegas primary care doctors, obstetrician-gynecologists, and eye doctors. Other specialists, including dentists, dermatologists and many more will soon be added to the service. To use this free tool, patients simply visit the ZocDoc website (www.zocdoc.com) or the free ZocDoc mobile app (iPhone, Android, and Blackberry) and enter their location, insurance, and the type of doctor they would like to see. ZocDoc then shows local doctors’ real-time availability, qualifications, and verified patient reviews to help patients choose the Las Vegas physician who best fits their needs. Patients then select an available appointment time and complete a brief confirmation process. With ZocDoc, patients can book anytime, anywhere – whether the doctor’s office is open or closed. ZocDoc helps Las Vegas patients get faster care by revealing a hidden supply of doctor appointments (including many last-minute cancellations) and making them instantly available online. This transparency reduces patients’ long wait times and increases efficiency for local medical practices – a vital service given the country’s current doctor shortage, which only stands to become worse with 32 million new patients entering the system under the Affordable Care Act. In the coming months, Las Vegas patients will also be able to use ZocDoc Check-In – the #1 most requested new feature to date by patients using ZocDoc. After booking an appointment, ZocDoc Check-In allows patients to fill out their medical forms online, at their convenience, prior to their visit. ZocDoc securely saves this information and will pre-fill forms when a patient books with a participating ZocDoc physician again in the future. ZocDoc currently offers appointments with healthcare providers in 33 major metropolitan markets across the US, including Atlanta, Austin, Baltimore, Boston, Chicago, Dallas, Ft. Lauderdale, Fort Myers, Fort Worth, Denver, Detroit, Houston, Las Vegas, Los Angeles, Miami, Long Island, New York City, Northern New Jersey, Northern Virginia, Orange County, Orlando, Philadelphia, Phoenix, Portland, San Diego, San Gabriel Valley, San Jose, San Fernando Valley, San Francisco, Seattle, Tampa Bay, Washington, DC, and West Palm Beach. ZocDoc is available in over 1,500 US cities, and covers over 40 percent of the US population. ZocDoc also offers a Spanish-language version of its free service called ZocDoc en Espanol (espanol.zocdoc.com; iPhone and Android) that helps Hispanic patients effortlessly find Spanish-speaking doctors and book appointments with them. To learn more about ZocDoc, please visit the ZocDoc press room. Follow the latest ZocDoc news on the ZocDoc blog, via Twitter, or on Facebook.